When I think of Greek power metal, the name Gus G. immediately comes to mind. His band Firewind has become the standard bearer of Hellenic metal, though the last decade has seen a fair number of decent outfits emerge from the Greek Isles. 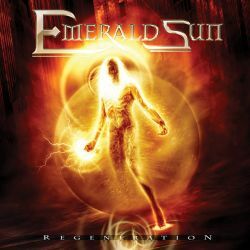 Emerald Sun is one of those bands that got a start in the middle of the new millennium's first decade, though they are of no comparison to the mighty Firewind. Instead, Emerald Sun's sound has more in common with Italianate power metal dominated by sugary riffs, anthemic choruses, and uplifting keyboard runs. Regeneration, the band's third album, sticks to this formula for the majority of its running time and provides a comfortable, if unremarkable, listening experience for genre fans. There does exist, however, a couple of instances where Emerald Sun surprised me by their dalliance with a much more powerful, grittier, sound. The album opener "We Won't Fall" is the first such instance and, being placed at the forefront of Regeneration, was a bit of a tease. With a nice bass intro from Fotis Toumanides and some meaty riffs from Johnnie Athanasiadi and Teo Savage, the track has an overall '80s metal ambiance to it. Some very spiffy licks are intertwined with tantalizing keys (courtesy of Jim Tsakirides) to make this a highlight of the album. Frontman Stelios Tsakirides delivers the lyrics, comprised of "us against them" disenfranchised youth themes, in true metal fashion with a polished, Halford-esque style. After such a promising start, though, Regeneration takes a turn for the flowery on the next track and wallows in the saccharine world of Euro metal melodies, cheesy lyrics, and spacey keyboard runs. "Speak of the Devil" offers an interesting break from the fromage, serving up heaping helpings of chunky riffs. Stelios' style has a harder, more menacing edge on this track while the choruses are much more enjoyable and memorable than elsewhere on the album. The keys are used only minimally, further distancing the song from much of what Regeneration has to offer. While this is definitely the strongest track on the album, I have to say that Emerald Sun does execute their chosen style with skillful precision. If bands like Rhapsody of Fire get your motor running, then Regeneration is an album you'll want to get your hands on. Aside from the unnecessarily ridiculous "alien" vocals on "Planet Metal" and the ill-advised cover of Bonnie Tyler's "Holding Out For A Hero", the album suffers from very few pitfalls. Since I personally prefer some real power in my power metal, with the exception of "We Won't Fall" and "Speak of the Devil" Regeneration doesn't do it for me.